Round the clock customer support no matter what the time, day or night. Our expert reviews panel have uncovered the best online blackjack casinos accepting Citadel as a payment method for Canadian players. So don't delay. Get started playing for real Canadian Dollars today in any one of these legitimate and reputable blackjack casinos online in Canada. Not only is Citadel one of the safest online payment methods available to Canadian blackjack players, it also doesn't issue any charges for making a payment or withdrawing funds using its service, so there's much to be admired in this home-grown deposit method. Sometimes referred to online as Citadel Commerce or Citadel Instant Banking, the scheme works by connecting users with their own personal online bank to complete the transaction. Thus, there's no need for Canadians to open up an account to make use of Citadel, nor does Citadel retain any of your personal data, so it's hassle-free, quick to use and helps to keep your personal information safe online. The only thing you'll need to get started playing in a citadel blackjack casino online, is an active online banking account. As whenever you make a payment to your bankroll you'll be required to log in using your online banking details to confirm and authenticate the transaction. What's brilliant about using this method is there's no need to have a separate account with Citadel, so transactions are completed quickly, and updated in real time so it's a great way to keep track of your online spending and make sure you're not depositing beyond your means. Blackjack casinos in Canada have been quick to embrace Citadel as a payment method, and for that reason you'll find the choice of top Citadel blackjack casinos available to Canadian players includes some of the best online blackjack casinos on the internet today. For Canadians who choose to add funds to their blackjack bankroll using Citadel to transfer real cash online couldn't be easier. Citadel offers three ways to complete a transaction using its service, so when you first attempt to make a deposit you'll have the option of completing your payment either via a dedicated Citadel App, online web page or rapid payment system to add funds to your account. All are free to use and offer the same fast and secure checkout benefits, so the method you opt for is entirely a case of personal preference. If you're playing in a mobile blackjack casino however on your smartphone, you may find the app offers the best compatibility while on the move. The only other thing you'll need to play at a Citadel blackjack casino is an online banking account, something the majority of Canadians are already in receipt of. If you don't have an online account set-up, almost every bank in Canada offers this service, so have a look at your banks website, or pop-in and speak to an advisor in branch to see how you can quickly get set-up. Once you have your login details to your online banking account, making a real cash deposit of any denomination using Citadel to complete the transaction is straightforward and simple. You'll find the amount you deposit shows up in your blackjack casino account right away so there's no reason why you can't get started playing for real Canadian dollars in a top rated Citadel Blackjack casino at the click of a button. Our pick of the best Citadel blackjack casinos online even offer incentives to Canadian natives who sign-up with Citadel as their default payment method, so be sure you take advantage of these when you register to play. Think a Citadel blackjack casino online is for you? Take a look at our frequently asked player questions to make sure you're up to speed with the ins and outs of this Internet based payment method. Citadel is an instant banking method that directs you to your internet bank to complete an online transaction. 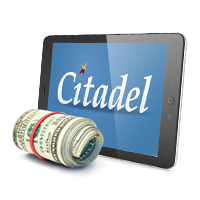 It works in one of three ways, either you access it via an app, go on Citadels webpage or use its rapid payment option. All three ways will result in you having to sign-in to your own banks internet banking portal to complete the payment. 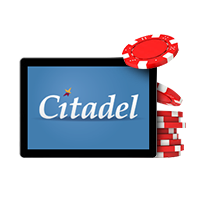 +Does Citadel allow online casino payments? Yes it does. Every blackjack casino on our best-rated list accepts Citadel to make deposits. You just need to select instant banking as your payment method when you're ready to upload funds to your online casino account. +Does Citadel charge any fees? Citadel doesn't charge a cent for its services but some online blackjack casinos can impose a nominal charge for accepting deposits and withdrawals this way. Check out the individual casinos T&C's page around using Citadel as a payment method to see where they stand in regards to this. +How does Citadel compare with other platforms? When it comes to safety Citadel is up there with the best of them as it doesn't retain any personal data or information on its users so there's very little, if any, risk to your online security using Citadel as a deposit method. It's also instant and doesn't charge any fees directly so it's cheaper than ewallet methods and quicker than say making a bank transfer or wire deposit. +Does Citadel keep my details safe? It doesn't hold any of your details so there's nothing to keep safe. Citadel doesn't require Canadians to open an account to make use of its instant banking service so by that measure the system doesn't hold any personal information about its users.